These Optical champagne glasses have a subtle amber glow, adding warmth to any tablescape. Add some fun to your table! Handcrafted in Naples. Dishwasher safe. 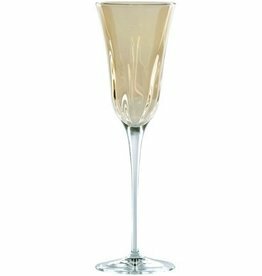 Vietri's clear Optical champagne glasses are a classic must-have for every bride! Elegant lines and substantial weight gives this collection the sense of timeless crystal. Handcrafted in Naples. Vietri's clear Optical drinkware is a classic and a must-have for every bride! Elegant lines and a substantial weight gives this double old fashioned glass the sense of timeless crystal. Handcrafted in Naples, Italy and dishwasher safe. The cool and sophisticated look of our clear high ball glass from Vietri's Optical drinkware collection will add elegance to your tablesetting. Use it for iced tea, mixed cocktails or lemonade. Handcrafted in Naples, Italy and dishwasher safe! Vietri's clear Optical drinkware is a classic and a must-have for every bride! Elegant lines and a substantial weight gives this water glass the sense of timeless crystal. Handcrafted in Naples. Elegant lines and a substantial weight give the sense of timeless crystal in the Optical Smoke Gray Champagne Glass. Elegant lines and a substantial weight give the sense of timeless crystal in the Optical Smoke Gray Wine Glass. Add some fun to your table with these amber wine glasses. Elegant lines and substantial weight give this Optical drinkware collection the sense of timeless crystal. Dishwasher safe. Handcrafted in Naples. Please allow 2 - 4 weeks for items not in stock. Elegant lines and a substantial weight gives this amber water glass the sense of timeless crystal. The Optical collection is handcrafted in Naples. Dishwasher safe. The Optical Gold champagne glass is trimmed in a delicate gilded rim, and its elegant lines bring sophistication and glamour to every table. The golden embellishment is effortlessly beautiful. Handcrafted in Naples. Handwash. Elegant lines and a substantial weight give the sense of timeless crystal in the Optical Gray Water Glass. The Optical Gold water glass is trimmed in a delicate gilded rim, and its elegant lines bring sophistication and glamour to every table. The golden embellishment is effortlessly beautiful. Handcrafted in Naples. Handwash. The Optical Gold wine glass is trimmed in a delicate gilded rim, and its elegant lines bring sophistication and glamour to every table. The golden embellishment is effortlessly beautiful. Handcrafted in Naples. Handwash.